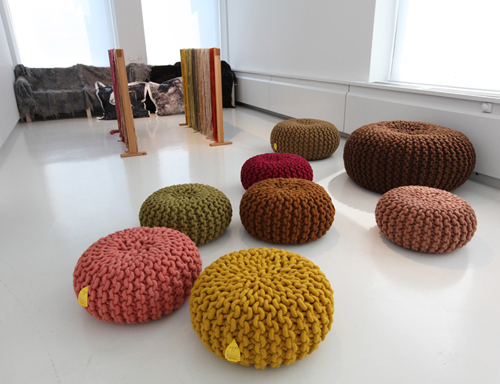 These beautiful pouffes from Christien Meindertsma were recently displayed at an expostion called ‘Farmer in search of style’ which was organised by Designhuis Eindhoven. The pilosophy behind the exposition is that everything seems to indicate that rural realities are influencing urban life. The greening of the city and the urbanization of the country will ultimately lead to the blurring of borders between these two domains. Designers, artists and architects are reflecting upon this exchange of ideas. In a first trial to understand and map this movement, through fifteen installations, Designhuis Eindhoven is exploring a new lifestyle where humans are seen as an integral part of the ecologic cycle, integrated in the process. I just voted for the poufs! 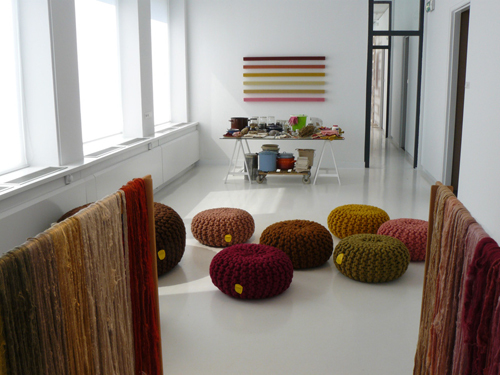 What an interesting thought, blurring borders between the country and the city… Yes those pouffes are wonderful! they really look like the ones I saw at Hema… or am I wrong. I love these! I’ve only ever seen them in shades of gray, but they are even more lovely in colors! Wonderful..! What a great, great concept…. And I love the title… I would love to go to this exhibit – so inspiring…! Thank you for sharing the information and photos. I went to this expo ( I live an hour or so from Eindhoven). These pouffes were great. The type of furniture that invites you to sit there with a cup of tea and stay….stay….